This patchwork tulip quilt block pattern is sewn by creating eight half square triangle units, along with a combination of squares and rectangles. The tulip is not a difficult quilt block to assemble, but do be careful to place the center bud in each corner (shown in blue) in the correct position. Follow the instructions to sew four Tulip quilt blocks. Repeat to make additional blocks as needed. Tulip block finished size: 9" x 9"
Choose any fabrics. The block illustrated was part of a quilt block exchange during a former quilting forum event. Square up one end of each fabric strip before cutting segments. 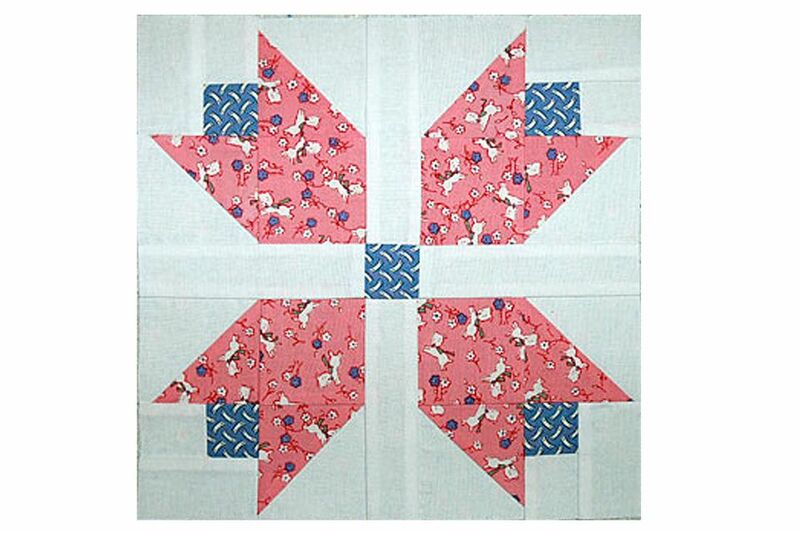 Tip: Use oversize (3") squares instead of 2-7/8" squares for triangle units. Use a square ruler with a 45-degree line to trim units to exactly 2-1/2" x 2-1/2" after assembly. My quick pieced half square triangle units tutorial includes trim-back instructions. Make thirty-two half square triangle units by combining the sixteen pink 2-7/8" squares and sixteen Kona natural squares. Follow the instructions in my quick piecing method to create the units. Each unit should measure exactly 2-1/2" square when complete. The Magic 8 method is another technique to try since it helps you sew eight identical half-square triangle units at one time. Honestly―it's not a bud, but we don't know what else to call the little blue square set into the "V" of the flowers. Sew a 1-1/2" x 25" Kona natural strip lengthwise to what remains of your blue print strip. Press to set the seam. Press the seam allowance towards the blue strip. Square up one end of the strip set and cut (16) 1-1/2" segments from it. Arrange a 1-1/2" x 2-1/2" Kona natural rectangle and a blue/Kona pieced unit as shown in the diagram above, with the blue square in the lower left corner. Sew the units together in that configuration and press the seam allowance towards the Kona rectangle. Repeat to make sixteen identical units. Use chain piecing to speed things along. Arrange a print 2-1/2" square, two half square triangle units and the pieced bud unit as shown in the illustration above. Make sure the tips of the pink triangles point towards each other and that the blue square is nestled into the "V" of the pink triangles. Sew the top row together and press the seam allowance towards the blue square. Sew the bottom row together and press the seam allowance towards the printed pink square. Sew the rows together, matching seams carefully. Press the seam allowance towards the bottom row (pink square/triangle combo). Repeat to make a total of 16 tulip units. Arrange two patchwork tulip units side by side, but oriented so that the flowers point away from each other. Place a 1-1/2" x 4-1/2" Kona natural bar between the units. Sew a tulip to each side of the bar. Press seam allowances towards the narrow bars. Repeat to make eight identical double tulip rows. Arrange two double tulips, as shown above, flip-flopped so they become mirror images of each other. Sew a 1-1/2" x 4-1/2" Kona natural bar to two opposite sides of a 1-1/2" blue square as shown in the middle row. Press the seam allowances away from the blue square. Sew the Step 2 unit between the two double-tulip units. Press the seam allowances towards the narrow unit. Use the rest of the components to make a total of four tulip blocks. If you need more quilt blocks, repeat the process again. If you want all blocks to be identical, cut additional strips of fabrics. For instance, you can cut sixteen 2-1/2" squares from a 2-1/2" x 42" strip. Or fourteen 2-7/8" squares from a 2-7/8" 42" strip. Always include a little extra for squaring up the strip end and making corrections as you cut. Vary fabrics in your patchwork tulip blocks to make them a little scrappier. Instead of making tulips from just one fabric, two of the blocks above use a second, but related, fabric for the squares. Use as many fabrics as you wish to make a scrap quilt. Our scrap quilts photo gallery illustrates how to use many fabrics in the same quilt.